We live in a world full of music. From early morning to midnight, we are surrounded by musical melodies. If you are a real observer, then you can easily relate to me. From chirping bird to noises of traffic or machinery, we get every kind of musical experience. I am glad that I am a small part of a beautiful and artistic journey of this eternal universe. We all love guitars. We also have been enjoying all kind of music played by expert guitarists, and we always encourage the new artists. The guitar becomes iconic for the young generation. It is a ‘must-have’ thing for the teenagers for their high-school. It is an instrument with strings that produces melodious music when it plucked by either fingers or a prick. Apart from the guitar, there is another instrument called bass guitar or just ‘bass,’ that looks quite similar to a guitar and even gives soulful music with its marvelous lower notes. Why then it is called bass and what the difference is the between bass and guitar! Let’s try to find out in this article. There are many differences between bass guitar and the electric guitar from which I am mentioning the significant differences here. If you observe both the guitars, you may find out the primary difference, which is appearance. Bass guitars tend to be bigger than the regular guitars, with a thicker neck and larger hardware. Apart from that, here are some other differences which you should know! The bass guitar and the electric guitar both are having different origins. A guitar, of course, is based on a lute. The bass guitar, on the other hand, is based on the double bass which is basically a stand-up bass guitar. The bass guitar completely replaces the double bass. The pitch range of the two musical instruments is entirely different. A guitar plays music in an octave higher than the bass. So we can’t forget this critical point when we talk about bass vs guitar. Guitar has a higher range than bass. But, despite lower range, it is not possible not to have a bass guitarist in the band. Both type of guitars and guitarists needed to complete a team. It can give the boost up. For solo performances, electric guitars can do right most of the time. If we talk about the role of both the guitars, then the bass plays a supportive role in a band, while a guitar is more in a lead role. But that doesn’t mean that the bassist is not essential. He/she can be considered as a ‘driving force’ according to the type of the concert. Guitar has six strings while bass has four strings. Bass strings are thicker and require more efforts to play than the strings of a guitar that is thinner. So, many people believe that the bass guitarists need more efforts than the electric guitarists. As we talk about the bass guitar vs electric guitar, let me tell about the headstock now. Here come the tuning keys! The tuning keys of bass are larger than the guitar. If you notice, you can realize that the guitar has tiny tuning keys. The larger keys of bass have taken shape from the double bass. Double basses did have the crucial tuning (key) shape. They are also easier to turn as they are large. You don’t have to twist the tiny things with thicker strings, which make them comfortable. Moving forward to discriminate bass vs guitar, The next thing is the way the stoop is strung on a guitar. Talking about the electric guitar, you just have to put the string into the bridge, go up, and make sure the strings are in the nut and then you slide it through a hole and bend it down and just wind it around. On a bass guitar, you have to measure the string out. You also have to pull it to put it into the hole through the arm slot and cut it off about an inch, or maybe an inch and a half from the hole. The next difference I am going to talk about is the string tree. On a guitar, the string tree is a thin strip of metal, which is bent to grab the strings. Bass guitar tends to have a much beefier string tree than the electric guitar. If you think that the bass has just four strings and that’s why it is easier to play, then you might be wrong. Depending on what music which you want to play and what is the purpose of your show can decide the difficulty level of both the instruments. It can be super easy or super tough. The amplifiers are also different. Most of the time they can be used interchangeably, but guitar amplifiers are specially made to accentuate the higher end of the electric guitars, where the bass guitar amps are meant for the low end. Both the guitarists can play their respective guitars by the same prick, but just because of having thicker strings, the bass guitarists have to use thicker pricks to prevent breaking. The thickness of the bass strings is one primary reason to make the bass guitar expensive than the electric guitar. So, if you ask me, my research suggests that some of us and especially newbies find the electric guitar easier. The bass is a large instrument with thick strings, and those are the reasons why some musicians find it difficult. Should I Play Bass or Guitar? 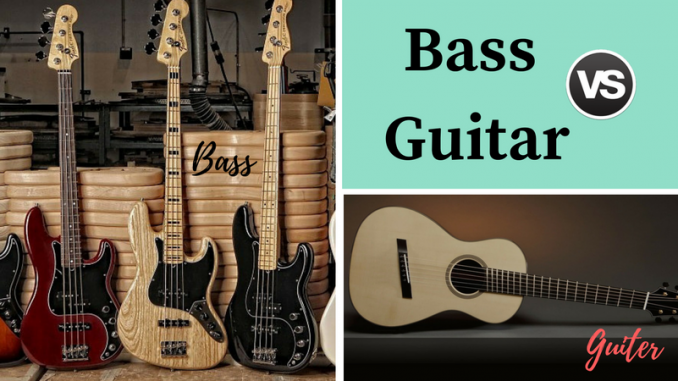 After knowing these differences between the bass guitar and the electric guitar, if you have the question what you should play, I have only one answer for you – Let your personality decide after analyzing all of your interest areas. It is the best way to determine which of the instruments give you the maximum amount of happiness! If you enjoy the spotlight, you should go for the electric guitarist. For that, you must become super creative and have to write/create the majority of the music. You also have to put all of your time and effort to learn the music theory. If you are unconventional and want to become a driving force but not as a lead guitarist, go for the bass guitar. Be in a team and enjoy each rhythm of the music. Playing the bass can make you better composer and arranger. Moreover, if you want to go for the gigging career, becoming a bassist can help you all way round! Now if we think about in a general way, some professionals suggest that one should learn both as the bass and the guitar both are connected to each other. The techniques and functions might differ, but the more you learn, the more opportunities you will get. Playing both kinds of guitars can make you a better musician all around. So ultimately it is up to your personalities and your interest areas. The fact is, whatever instrument you choose, there are chances that you will change it in the future after some years. We need change, as well as different learning time to time. You can try some of the orchestral VST software for the variation. At last, I just want to say that, be versatile and try something different every day. If you are meant to be a great musician by all your hard work and passion, you will be – tomorrow or the day after tomorrow! Good luck with your beautiful musical journey. Stay blessed and keep rocking.